Not all condo's are the same. At Jan's 3rd floor Studio you'll feel right at home not like your in a hotel room. Cozy and comfortable. Ocean views from the minute you walk in till you wake up to a stunning morning sunrise. Comfortable furniture and King bed. Tall cushioned balcony furniture so you can see spectacular views. Lots of storage areas so your not tripping over your bags. It's the little things that make your vacation enjoyable. Not to high and not to low for a perfect view of entire beach and pool.. Unit has been updated, freshly painted 10/17 and replaced air conditioner 2/18. You're within walking distance to Civic Center, restaurants, movies, Main Street fishing pier, Bandshell, shopping, water park, boardwalk amusement park. Sun Splash City Park is right next door. Lifeguard control center next door. There are 2 New restaurants beachfront just north of condo within walking distance. Pool is heated in winter months. There's a great exercise room for those who feel the need. Guest game room and guest computer center in lobby. PLEASE READ COMMENTS from our previous guests. One of the largest pools (heated in winter) on the ocean plus a huge Hot Tub affords you a perfect view of everything from the beach goers to the surf. You won't be disappointed. You can rent beach chairs, umbrellas, floats, bikes and four wheelers directly on the beach. Fly through the sky in a parasail or just watch others from your balcony. Watch fireworks from balcony in summer. The Orlando theme parks are only about an hour away. The Kennedy Space Center and wonderful St.Augustine are close by. And let us not forget DAYTONA INTERNATIONAL SPEEDWAY only five miles from condominium. Perfect location for Bikers too. Two new beachside restaurants opened within walking distance. Early morning breakfast on the balcony. Walk the beach, ride your bike into the sunsets, and take a stroll to the shops or pier. Relax by the pool and soak in the Hot Tub while the sky turns shades of blues and pinks. People watch and listen to the waves from your oceanfront balcony. 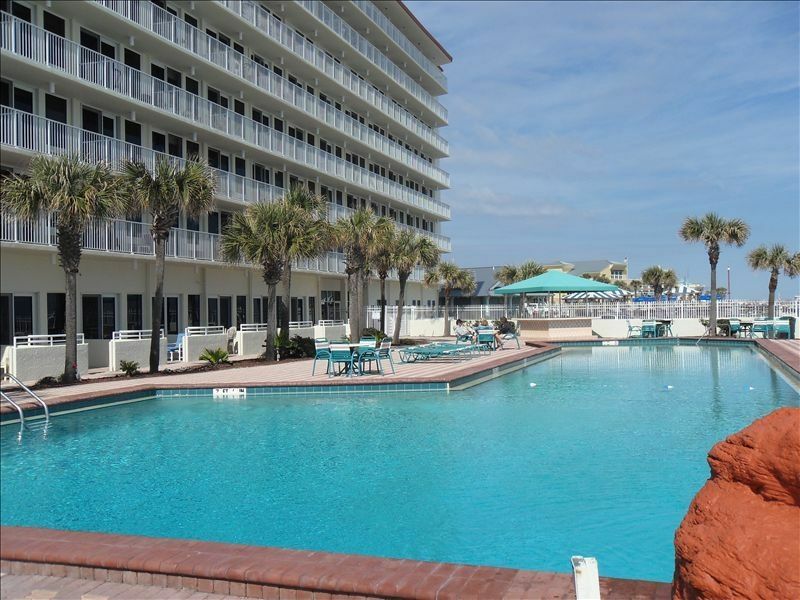 No matter what you do in Daytona Beach, you will love it and you'll love this condo. PLEASE SEND INQUIRY BEFORE BOOKING Holidays as rates may be higher. DAYTONA 500 RACE & BIKE WEEK. EVENT RATE $1000.00 WEEKLY ONLY. Ron and I(Jan) moved to Florida from Baltimore Maryland in 2002. We live in Palm Coast about 40 minutes from our condo. We absolutely love our ocean front condo and sitting on the balcony letting all the pressures of life float out into the ocean. If you need anything during your stay we're just down the street. We know you'll enjoy it just as much as we do. We care about your vacation as much as we would our own. We think the location of our condo is perfect. We are close to Orlando, St. Augustine, Marine Land, and not to mention the Atlantic Ocean is the front yard. Only a few miles to the Daytona Nascar Race Track. Walking distance to Main Street Pier and Bandstand .Historic Beach St. around corner full of shops and eateries, Close to Peabody Theatre of Arts and Music. Daytona flea market a must see. So much to see and never enough time. We have maybe the largest and deepest (10 ft) pool in Daytona Beach. Well kept and clean grounds and building. Quiet relaxing beach front. Ocean front not ocean view. Always someone around to help if need something or have questions. Next door to the Newest Lifeguard Facility. Two new restaurants directly on beach practically next door. Great location to racetrack and bike week functions. 40 inch flat screen TV, DVD, Cooking Supplies and Utensils provided, Linens & towels provided with laundry on-site (4th,5th,6th floor), Huge 10 ft, deep Heated Swimming Pool (shared) and Ocean-side Hot Tub(shared), Comfortable KING-size Bed, Queen-size Sofa Bed, Coffeemaker, Ironing board and iron, Blender, Tall Balcony table and Chairs. This is a No Smoking and No Pets Condominium, Smoking on Balcony only. Great little unit, resort needs a little TLC. The studio unit itself is great and the owner is very attentive. The location on the beach and near ISB can't be beat. No complaints whatsoever there. The unit was clean and everything I needed was available. I was there for business, but this unit would work for anyone who needs accommodation for a couple or two adults and up to two kids. I think it would be crowded for four adults. The overall resort property needs some TLC. Exterior hallways needed attention. The pool area was nice but could also use a little updating. The pool itself was fully functional and the water was really nice, especially in comparison to the ice cold ocean water of mid-March. You do need to carry an additional key to get into anything, including vending, pool and even the lobby after 7. There also isn't a lot of parking. Overall, I'd say you will be happy if you choose this unit--lots more pros than cons and the cons have nothing to do with the unit itself. My husband and I enjoyed our stay at Jan's Harbor Beach condo. We had everything we needed. The Condo is very clean & tastefully decorated. The big plus is a very comfortable king size bed. The view from the third floor balcony is fabulous for watching the sun come up in the morning & beautiful sunsets at night. Plus the peacefulness of listening & watching the ocean. It was nice to be able to walk the beach to restaurants, bars & shopping. The resort was very quiet & we enjoyed conversations with others staying at the resort. The pool & hot tub were nicely heated & staff were very polite & helpful. It's was also useful to have laundry facilities on site. Also for safety the resort is locked up at 7pm nightly. Owner Jan, is very prompt on returning any messages & great to work with. We came here for the Daytona 500 Race week & had perfect weather. So time here spent was well worth it & my only wish is that we would have stayed longer. Very happy we chose this property for our 8 day stay. Weather cleared, sun came out, pool and hot tub beckoned! The condo itself was nicely decorated, the most comfortable bed ever, everything we needed to do some light cooking. And the price and value was great. 3rd floor ocean view was everything we hoped for. The Resort itself could use some upgrades, a little dated, elevators could be an issue, and no lighting in the back parking lot, North side. But overall, we were very content. We'll be back. Thanks Jan! Exactly as described. Perfect fit for our needs. Super comfy bed, cute decor, safe and clean. Janice wonderful to work with. I would highly recommend this studio unit for a retired couple or like us a retired couple with a college age student who just wanted someplace warm to get away to, even if stuck with her parents! PS to future renters, we stayed for 1 week mid-January which was perfect - not so crowded. Normally, we would not have rented a studio, but this one was an exception. Great location, awesome ocean views and opportunities for walks on the beach. Great stay! Exactly what we expected! Very happy with everything!